Realizing the immense promise held out by QIS, on the one hand, and the numerous challenges that need to be surmounted by the physics community before the power and versatility of this resource can be harnessed into productive activities, on the other, the EJTP team finds it an opportune time to come up with a Special EJTP Issue dedicated exclusively to QIS. This would provide researchers with a collective platform for presenting their findings to the extended readership within a short gestation. (f) Fundamental Issues in QIS e.g. Bell Inequalities, Nonlocality etc. (i) QIS & Fundamental Physics e.g. QFT, GTR, Black Hole Dynamics & Cosmology. Ammar Sakaji is a Condensed Matter Physicist, visiting Professor at Ajman University, faculty member at the Naval College. He is co-Editor of Electronic Journal of Theoretical Physics (EJTP), Senior Scientific Advisor of the Gravitational Wave Group. Ignazio Licata is Full Professor and Scientific Director at ISEM - Institute for Scientific Methodology, Palermo -, Editor in Chief of EJTP. His current research fields are Foundations of Quantum Mechanics, group approach in Quantum Cosmology, Quantum Gravity, Quantum Field Theory, Information Theory, Physics of Emergence and Organization. Sara Felloni is a postdoctoral fellow in the Quantum Information team at Telecom-ParisTech, France. Her current research interests concern quantum noise models, quantum computation and communication protocols in experimentally realistic conditions, and quantum information representations. QCW2010 is a two-day workshop on theoretical and experimental aspects of quantum communication and quantum cryptography. This event is organized by UNIK - University Graduate Center of Kjeller, at the Kjeller Technology Cluster, located half-way between the Oslo Airport and downtown Oslo in Norway. QCW2010 will focus on practical advanced solutions for quantum communication and cryptography currently under development in European and world-wide partnerships involving academic research centers, commercial companies and public consortia. 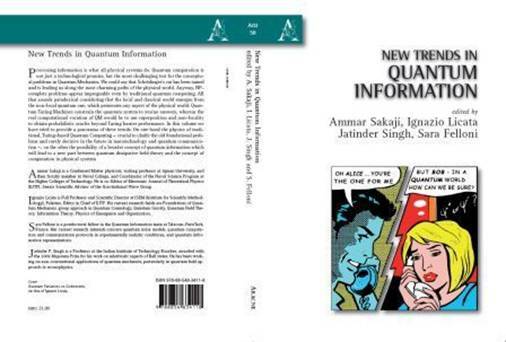 Quantum communication technologies developed in the trusted environment of experimental laboratories have recently addressed industrialization and commercialization, thus facing expected and unexpected challenges: from security vs. business requirements and conformity to standardization and legal specifications, to field operational tests under malevolent attacks. Aiming to provide network security for communications, quantum fiber-based and free-space technologies are both becoming a reality across optical networks, and will thus be discussed at QCW2010 by experts in the field within a global perspective. If you need further information about the book, please contact us at info[AT]ejtp.com , ignazio.licata[AT]ejtp.info, sara[AT]unik.no , jatinfdm[AT]iitr.ernet.in, Arcane Editore, or EJTP Editorial Board Members.